Description: The morning Capitol Limited (Train PO30) rolls into Connellsville on a cool beautiful morning. Time here is 8:08 AM, running a little late today, but that just makes for better sunlight. Both engines are GE P42DC. 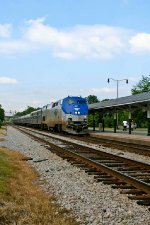 Description: Amtrak P089 with eng 203, races alongside Highway 301 and the wheat fields of northern Garysburg, NC. Title: Train 30/P030 "The Capitol Limited"
Description: The train derailed while backing around the wye the night before. Morning passengers were bussed to Chicago.